Below is a critique given to an advanced photographer familiar with Adobe Lightroom and Photoshop. In this case my recommendations are highly technical and targeted to the photographer’s skill level. Don’s critiques will have comments and suggestions that are appropriate for your skill level and experience. Overall Impact/First Impressions: The first thing I see is an overall reddish color cast. The shutter speed you used produced a pleasing effect in the water although I prefer slightly longer shutter speeds for this sort of scene. For moving water photos I recommend bracketing several different shutter speeds so you have the opportunity to pick the most pleasing effect. A person in a red jacket (on the trail upper right) is normally a great element to include in a nature scene, but in this case my eye sees a tiny splash of distracting red color. Had you captured this person on the bridge it may have given a complementary color accent to the surrounding green, plus a sense of scale. Given the opportunity I usually like to take the same scene with and without people. Composition: Nicely balanced composition with the waterfall placed in the one third/two-thirds position. The square crop is a pleasing rendition with just the right amount of mossy green foreground. Color: Overall red cast. I recommend trying to remove the red color cast by using a levels command in Photoshop (Ctrl L). Using the middle (gray) eye dropper, click on a light grey portion of the waterfall or perhaps the gravel bar in the foreground. Try several different areas that you know should be neutral gray until you see the best overall color balance. Tone: The brilliant white waterfall in an otherwise dark scene presents a difficult challenge in controlling excessive contrast. You’ve struck a good compromise in providing detail in the shadows without blowing out too much of the waterfall. However, there still may be room for improvement (see below). Suggestions: Clone out the person in the red jacket upper right. There are several methods you could try to recover some of the highlights in the waterfall while maintaining a proper exposure in the rest of the scene. Using Lightroom Develop Module experiment with the “Recovery” tool and possibly adding a small amount of “Fill Light”. 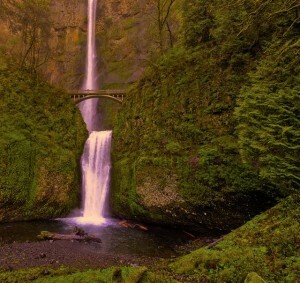 Use the “Graduated Neutral Density Filter” tool to brighten both sides of the photo but not the waterfall. 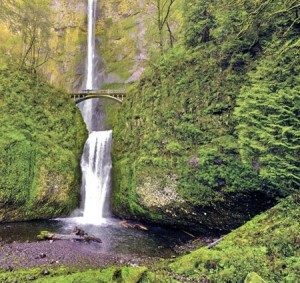 Alternately, you could process the RAW file twice; once for the highlights in the waterfall and once for the rest of the scene and then combine the results in Photoshop.